Let me introduce you to Amwell! 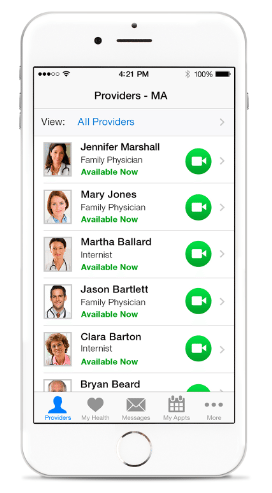 Amwell is the nation’s largest telehealth company. What exactly does that mean? It means you can have access to an array of health care professionals from your own home. All their professionals are board-certified, licensed doctors, and they are ready to help you no matter the time, date or place. You can access Amwell from a desktop, tablet or on your phone. They are here to help, from minor illnesses and injuries, general health and wellness concerns, prescription refills, to chronic condition management. As a person with a chronic illness, I can’t tell you how important this is too me. Sometimes it takes days to hear back from my doctor for a simple question or a prescription refill. Amwell doctors are available 24 hours a day, seven days a week, and are dedicated to keeping you healthy, all from the comfort of your home. So imagine my excitement! 100% remote sesrvice, 24 hours a day. No need to go to doctor offices, which have limited hours, are usually full of other germs and virisus and you have to pay usually around $100 depending on insurance. 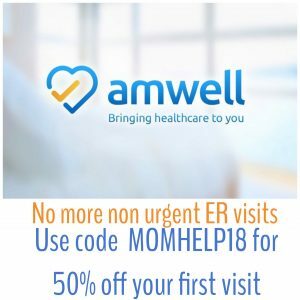 With Amwell you don’t have to leave your home and the very kowledgable doctors can even prescribe you medications and send them to you nearest pharmacy. I can tell you how many times I’ve called the nurses line, only to be told I still had to go in, wait until I could be seen and then wait for them to fax my prescription. If it is an urgent matter you just can’t wait that long, but who wants to pay and ER visit?!?!? Some insurance companies cover telehealth visits, and some offer their own telehealth service. If your insurance company doesn’t currently cover telehealth, you can still use the service. The cost of a visit is $49 for a 10-minute consultation. Use code: MOMHELP18 to get 50% OFF your first Visit! EXPIRES 12/31/17.